An ex Navy SEAL takes some teens into a forest full of mutants for some reason. Why does one of the mutants look like a tree? Are hideous freaks the best meth lab employees? Do necks really snap that easily? All these questions and more will go thoroughly unanswered as the film moves from one random fight to the next, fleeing from narrative responsibility at every turn. 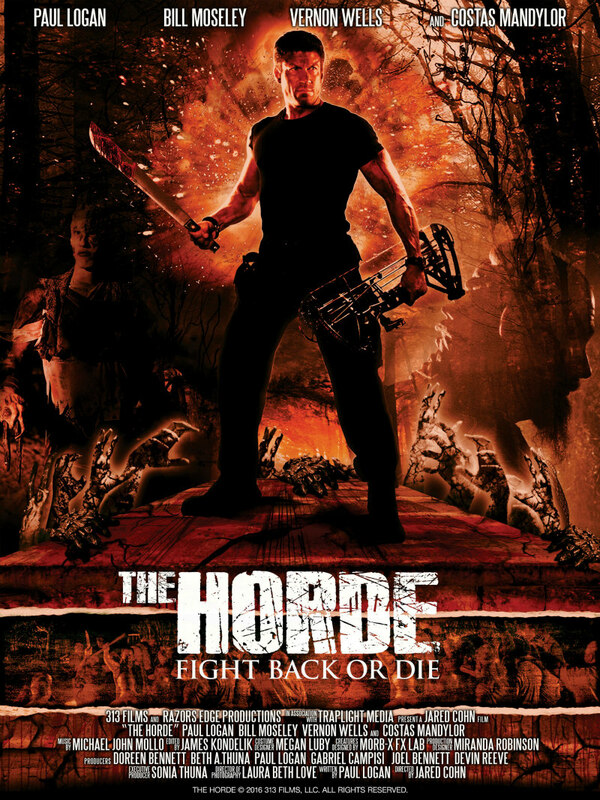 The Horde might have one of the worst opening acts in movie history, even by the low, low standards of horror films with a budget seemingly composed of loose change found in the seams of the sofa. It’s hard to pick out the worst element from these scenes. The dialogue is painfully unnatural, the acting utterly forced and the broadly drawn teen types totally unlikeable. Right at the middle is a muscle mass posing as a human called Paul Logan. He’s hopelessly stilted, laughing awkwardly at every line and looking far more interested in rippling his abs than having anything to do with his comely co-star Tiffany Brouwer. It’s all the more difficult to take when you realise that Logan actually wrote this script himself. This is a fellow who had the absolute power to change his lines or cut them altogether and stay at home. Instead he did… this. After awkward romantic stuff and assembling a very unlikely photo field trip into the middle of nowhere, we finally get on the road and find the first opportunity for a bust up. This alarming scene sees the trained military man absolutely go to town on a bunch of hicks who dared to talk to the teens in his care. And he doesn’t hold back, breaking noses, snapping arms and over-reacting in the most manly way possible. It’s here that you finally get a glimpse of what the movie is going for – not only does it think it’s an action film, but it also imagines itself to be a fun '80s throwback with a meaty lead and some of the cheapest sounding heroic music I’ve ever heard. It’s fair to say that once this becomes clear the film does improve, but only because it would have been practically impossible to get worse from the low bar set by the opening sequences. Eventually, Logan’s uni-muscle finds himself knocked out while the rest of the kids and his recently proposed to fiancée (yes they find time for that) are stolen away by a gang composed of random mutants and also some escaped convicts – just for some added flavour. In fairness to director Jared Cohn, there’s some pretty decent gore on display and the fighting is reasonably well staged, but it all stutters to a halt once too often, getting caught up in overwritten speeches by Vernon Wells (yes he of Commando speared-by-a-pipe fame) and Costas Mandylor (Saw). After some budget stretching explosions and an over-reaching car chase, the film meanders to a close. A lot of people, and mutants, have died and the lesson seems to be – bring a gun to the fecking woods people! 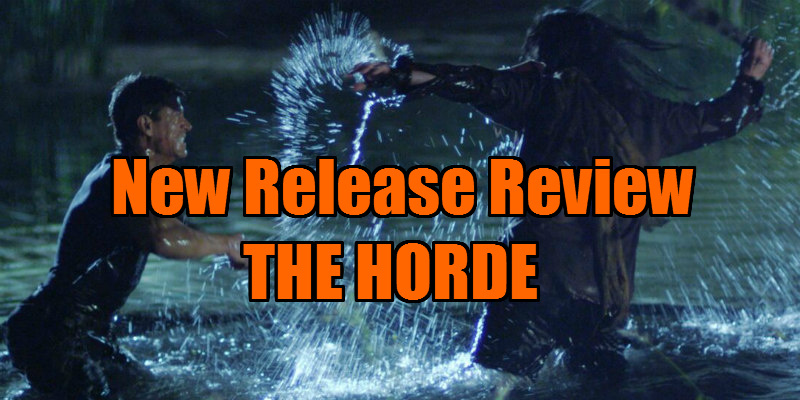 The Horde is an action horror for people who have run out of anything else to watch that satisfies either of those genres. Best avoided.